Here we are with another installment of Women with Gusto: a series where I share my chats with fabulous Gusto-driven women that I've had the pleasure to meet. The hope is that their beautiful paths to purpose can inspire you to follow yours and to not settle until you too, are living the life you dream of and deserve. Tracey Adams is a knockout woman. She's an all-star. And the best part about her? She doesn't claim to have it all figured out. This is something I really respect about Tracey. She's humble...realistic...down to earth. Let me tell you, she knows A LOT about emotional intelligence, about knowing what you think, feel, and want and how to get your voice in the room in a way that feels authentic to you. But she also knows that developing emotional intelligence is a process...and one that never ends. We are ALWAYS working to be better, and that's okay. Tracey isn't afraid to say she is working on it, too. Even after a PhD in the Study of Emotional Intelligence, a Masters in Curriculum Development & Adult Learning Theory, and a stellar employment record! Like I said, Tracey knows a lot. And she is bringing this knowledge and the strength in leadership that it can offer to other amazing women through her business, ThriveOn Seminars. "My purpose and mission is to help women develop emotional intelligence so that they can more powerfully get their voice in the room in order to advance their career and increase well-being." She explains that corporate women often find themselves in organizations where they feel diminished or unheard. She is helping women learn to set boundaries and say what they think, feel, and want more confidently. If that doesn't sound like something you can get behind, I don't know what is! She's full of contagious energy and a drive to help other women succeed. She's proven through her own story that women can overcome obstacles and live a highly successful and fulfilled life. She possesses a beautiful optimism that propels her forward despite difficult circumstances. She works hard to enjoy the process, the journey, in any situation and always looks to new perspectives for understanding. She knows how to set and respect meaningful boundaries for herself and others. She owns both her creative and analytical personalities and knows how to leverage them for her own fulfillment. She knows the importance of remaining in the moment and taking action NOW rather than getting lost in the future. She sets inspiring goals for her future and knows how to work slow and steady to make them a beautiful reality. She sees value in surrounding herself with inspiring individuals and mindfully connects to finds a tribe to support her goals. Tracey's entrepreneurial journey is unique. Tracey is not only an entrepreneur, but a powerful career woman as well. She says, "My day job fuels my dream job and my dream job fuels my day job. I feel very aligned." How incredibly inspiring is that?! She is able to help people be better in both her career and her passion....they complement one another beautifully. But it wasn't always that way. When I asked her what moment motivated her to take the leap to start her business she explained, "I had a bad boss. I told my friend that I just can't do one more day with this boss. And thank goodness for him, because he motivated me to take action to start my own business on the side!" One little slice of advice that Tracey shared with me really stuck. We talked a great deal about purpose and how she found hers. She said "My purpose unfolds when I stay in the action." What does she mean exactly? Try many things! See what works for you and what doesn't...and leave what doesn't behind without guilt. It is about finding what lights you up! Find what your passion is and continue to take it even deeper. And the fact is, it's not always a clear path. We live in a society that often pressures us to have and know our ONE true purpose RIGHT NOW. The fact is, it's not always that clear...and that's OKAY! Another misconception that we need to escape is that our purpose is linear or clearly fits in a box. This simply isn't reality for many of us. You can be both creative AND analytical. You can use both sides of your brain. Your purpose doesn't simply need to be either artistic OR straight-laced. You can have both! As Tracey said, "You can be grounded as an artist and still be creative." And what if you just don't know where to turn next? Tracey shared a story to explain that was SO inspiring. When she was having trouble with her bad boss, she shared her struggles with her close friends and one simply said, "Tracey, I think you're done with bosses." And just like that, a new path was open to her. She said if you don't know what your purpose is, ask someone else! Ask someone close to you what they see for you in the future. (Side Note: She told me she sees me taking my business and traveling worldwide...and that sounds pretty fantastic to me!) The validation of hearing ideas from others often opens up pathways that we were too afraid to approach or see ourselves. So who are YOU going to ask next to continue the path to pursuing your purpose? 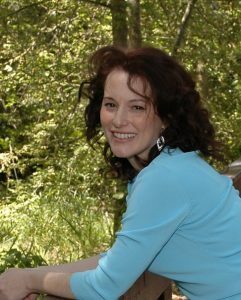 If I can say one thing about Tracey, it's that she has learned how to know herself and use it to make her life better. Her personal development is at impressive heights and we can all learn a little something from what she's shared. When I asked Tracey what she has learned, loved, or leveraged about herself that has helped her as an entrepreneur, she shared, "I've learned that I thrive in structure but not too much of it." She explains how when she was doing her own business full time, she strategically created her own structure...choosing a specific coffee shop to get work done, working at similar times of day for productivity, joining groups of entrepreneurs to hold her accountable and help her stay inspired. She says that she needed this structure to get things done, but that she also LOVED the freedom of being your own boss...of getting to choose when and where you get things done, of making the final call about how things go, of allowing creativity to be the driving force more often. But she also shared that entrepreneurship can be isolating...and I firmly agree. It can be a lonely world. Her advice? Surround yourself with others along the same path! Join groups, share goals and accountability, get inspired! Belonging is one of our most influential needs as humans, and you can create your own sense of belonging in new and innovative ways. Tracey also shared something about being an entrepreneur that sang volumes. "We all have so much power. You can be whoever you want to be." She says that often people think they have very little power in this world. Also, many people don't even know what they are good at and often suffer because of it. 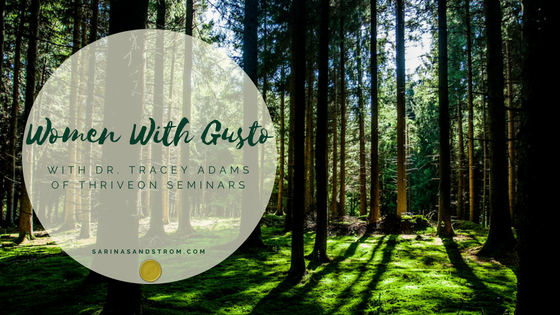 Tracey did a great deal of work with Gallup during her doctoral degree and she talked a bit about the Strengths Finder, a tool which helps people identify what tasks/tendencies they are really good at and teaches them how to leverage them at work and in life. The benefit? More FLOW! Tracey explained that she is most in flow when she completely loses track of time...most often during creative tasks. She says the more you know about yourself and what you are good at, the more often you can reach this state. In business, this is SO powerful. What way of doing things feels best to YOU? That's what it's all about. If you find those truths, your business will feel more authentic and more FUN in the long run. Tracey and I connected on the fact that we both easily get caught up in the future. She said, "Many of us get caught up in the past, which we can't change, or the future, which we can't know what is going to happen. It keeps us out of our lives." She shared that her present self fights with her future self all the time and if you aren't in the present taking action, the future can't happen. It's important to always know to pull yourself back when you get too wrapped up in what might happen in the future. This is what helps Tracey get up and live life with Great Enthusiasm every morning..."Another day of just being in my life and being present. When I'm in the moment, I feel so fulfilled." Everything works out despite how it may sometimes seem. Everything happens for a reason and leads you to the next fantastic chapter of life. It's a process. Success doesn't happen overnight. And despite what we may see of millionaires, they didn't get there automatically. There is a great deal of slow and steady hard work that happens. Taking things one step at a time and remaining present does a whole lot more good than getting lost in what could be does. When I asked Tracey what her future goals for ThriveOn Seminars were, she said, "My goal is to move all my workshops online so they can be automated and utilized worldwide. I want to do 4 in-person workshops each year and after my kids are out of the house, I'd love to take my workshops on the road and travel around the world!" She is a big advocate for the power of retreats, of stepping away from your normal surroundings and seeing things from a new perspective. She says that it has helped so many of her clients open up into emotional learning that is almost always new to them. Our society teaches cognitively, but opening up to emotional learning can be incredibly powerful...if a little challenging at first! Her retreats help women step into their power and open up their ability to know what they think, feel and want. If you are interested in learning more about Tracey, her retreats, her online workshops and ThriveOn, I highly encourage you to visit her website. Her work is changing lives and I am so excited to watch it continue to transform women into more empowered versions of their wonderful selves. Follow ThriveOn on Facebook and be sure to take advantage of Tracey's free download: 10 Tips for Using Emotional Intelligence to ADVANCE YOUR CAREER. A HUGE thank you to Tracey for sharing all of this amazing advice with me and for allowing me to share her inspiring story with other fabulous women. I hope you are feeling even more empowered by Tracey and her drive to help others succeed in work and life.